He's a walking jolt of consumer confidence. Spend just a few minutes with Cabell Childress and you'll feel better about the economy. "I think we have definitely bottomed out and I think we are starting to see signs of a recovery," he says. Since January, his listing team of four real estate agents has sold 95 houses. It isn't unusual. The Childress Group has been No. 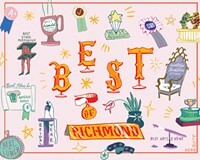 1 in sales volume at Long & Foster in the Richmond region for the last five years. In the business since 2001, the 37-year-old has an aggressive, multi-pronged attack — "tactical pricing," house readiness plans and marketing just about everywhere — and the results that prove it works. As for the economy? Childress says the housing market is coming back. "Generally speaking there has been an upward swing in values due to a combination of a shortage of inventory," he says, "and the natural spring upward bouts." That real estate agents are getting so much love from Style readers — including Wes Atiyeh and Sallie Rhett of Joyner Fine Properties — can't be a bad sign.